- "As Pluto passes the 4th cusp this Island is again due to be vulnerable to a national crises and there is likely to be an example of heightened volcanic activity." Transit Pluto made its first entry into the sign of Capricorn in January 2008, but didn't establish itself there until late November of the same year. It made its first passage of the 4th cusp in the chart of Iceland in January 2010 and will swing backwards and forwards over this point throughout the year, making its last exact contact in November. From Skyscript: ... notice that Reykjavik on May 29. 2008 was hit by a significant earthquake that measured 6,1 on Richters scale. At this point Pluto was located 0CP21, which is exactly on the contra-antiscia of Saturn, lord of the 4th. Iceland has many active or potentially active volcanos and the eruption of Helgefjell on Jan 23. 1973, which buried the nearby town of Herculaneum should be mentioned. There was a solar eclipse on Jan.4.1973 at 14CP10, which is in the 4th house of the Iceland chart. The 70's were also colored by another crises of national and territorial importance, namely the Cod-war. As Pluto passes the 4th cusp this Island is again due to be vulnerable to a national crises and there is likely to be an example of heightened volcanic activity. "The eruption occurred a mere 6 hours after the Sun entered Aries and crossed the Vernal Equinox (Spring). Both luminaries are on sign cusps. The Moon is square the Midheaven. The Sun opposes Saturn, Lord of the 4th. 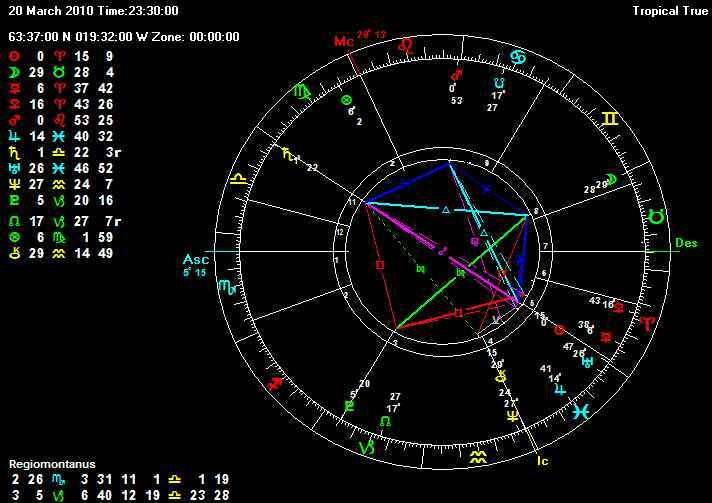 There is the need to see how the story develops as the Sun moves in on the T-square with Saturn and Pluto." The Volcano last erupted in 1823. Checking with the Vernal equinox of that year there is an interesting alignment of the Sun, Pluto and Mars - all in the first degree of Aries. 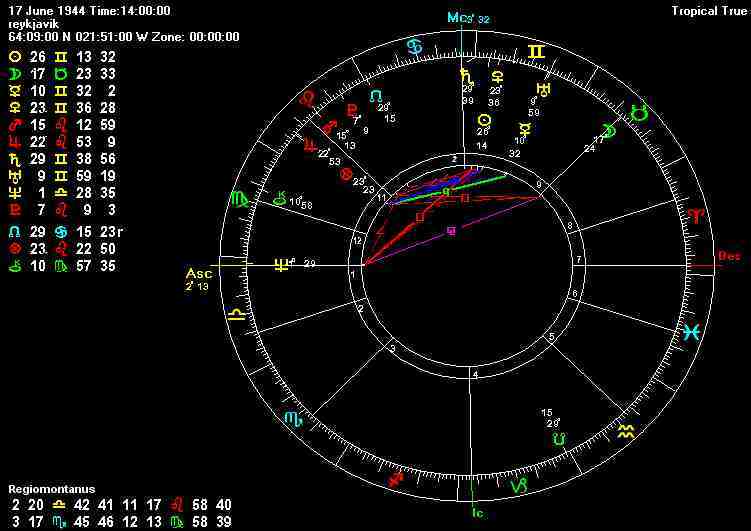 There is powerful activity in the first degree of Aries through 2010. "One of the things we should be asking ourselves is whether the could be a relationship between civil affairs and a build up of tensions in Nature," Bevan adds. Another giga-sized earthquake does not necessarily have to occur on the next 45 day key-date but if that were the case then 13 April is the date. The first thing to do is to see whether a new major afterquake occurs after the Moon has moved 90 degrees forwards in the sky, which brings us to 5 March. It seems to be too early to say anything for certain about how this story will develop. The first important cross-roads is to get past the 5 week barrier from 20 March and that leads to 24 April. Monitoring how the main Volcano performs at this point of time might give a better indication of the long term picture. The 24. April could be the monster volcano Katla. Experts will be keeping an eye on that one! The Sun was involved in a T-square upon entering Aries. The drama started shortly after the Sun entered Aries, but the direction through Aries gives it two heads - first Saturn, then Pluto.